The Enola Gay | Just Shooting Memories! I have posted numerous photos from my trip to Washington D.C. and from the Udvar-Hazy building on the Air and Space museum. There are so many fascinating air planes located at the Udvar-Hazy building, but I believe my favorite has to be this one, The Enola Gay. For me, it may even top the SR-71 Blackbird and the Space Shuttle. The Space Shuttle was smaller that I expected and the SR-71 was so shrouded in mystery that all there is to it is just being a cool plane. On the other hand, The Enola Gay has it’s place well marked in history with death and destruction, but also saving many lives. 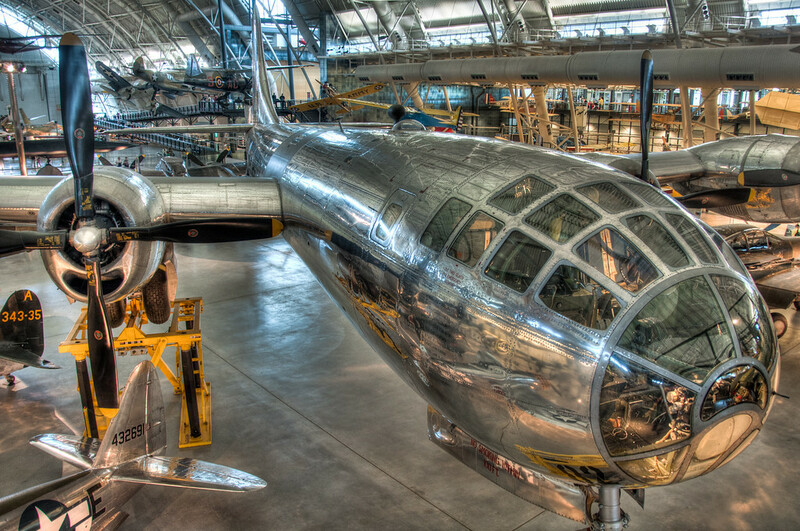 The Enola Gay was the first aircraft to drop a nuclear bomb during war time on the Japanese city of Hiroshima. Although it caused massive destruction and loss of life on the Japanese, it saved countless American lives by helping to stop Imperial Japan and eliminate the need to take the Japanese mainlands. I am sure if you could stay long enough, it would have some amazing stories to tell. Daryl, I totally agree. I almost missed this airplane, as the building is so full of planes above and below each other. I was ready to leave and walked right passed it, then realized what I almost missed. That museum is so full of great history, it’s indeed a National Treasure. Yes, it is definitely a national treasure. The best part is that all the Smithsonian Museums are free. The DC area is so saturated with history like this that it would take a lifetime to give it the justice that it needs.